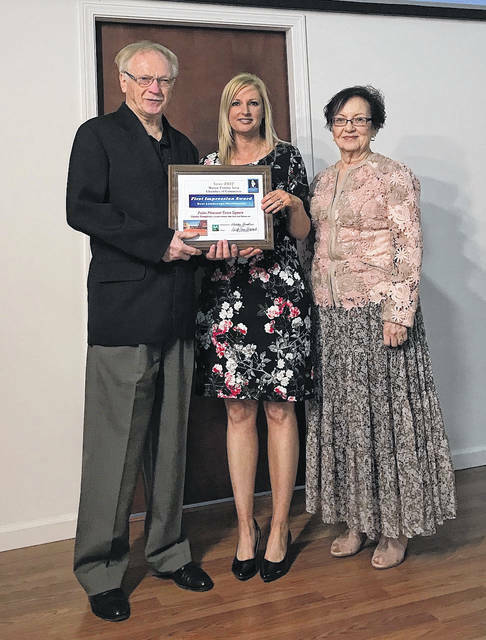 Bob McMillian, pictured at center, was honored by the Mason County Chamber of Commerce this week with its Community Service Award. Also pictuerd are Chamber Director Hilda Austin and Chamber President Leigh Ann Shepard. 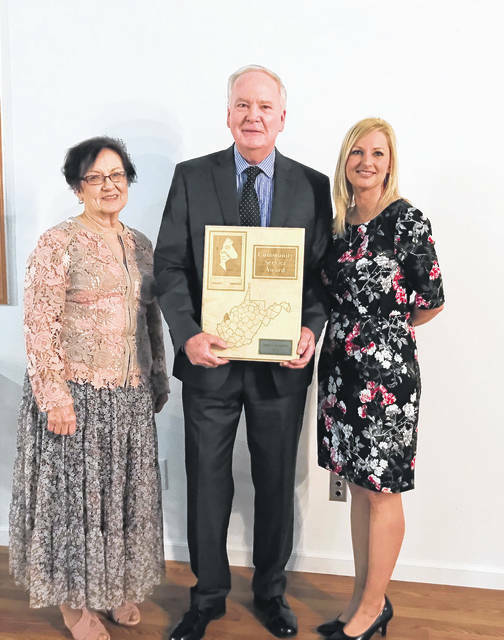 Charles Humphreys, far left, accepts the Best Landscape Award for the Point Pleasant Town Square project, which includes Hartley Square. Also pictuerd are Chamber Director Hilda Austin and Chamber President Leigh Ann Shepard. 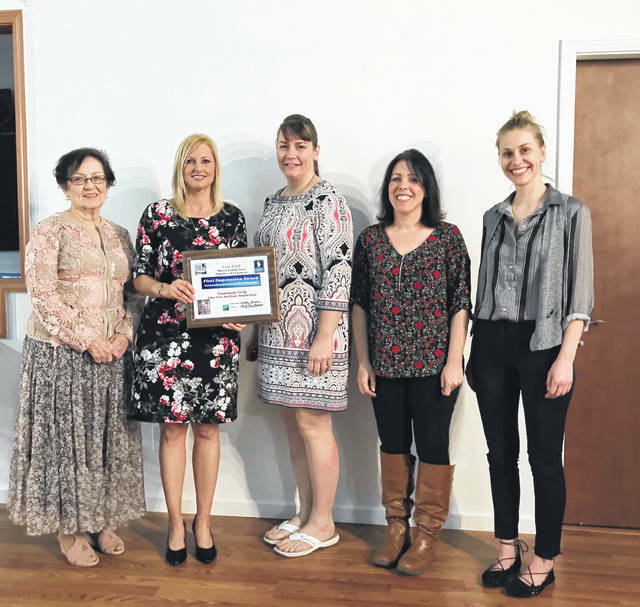 Counterpoint Coooperative owners, Marqkita Sexton, Ashley Wamsley and Kelsi Boyd accept the Outstanding Downtown Revitalization Award from Chamber Director Hilda Austin and Chamber President Leigh Ann Shepard. 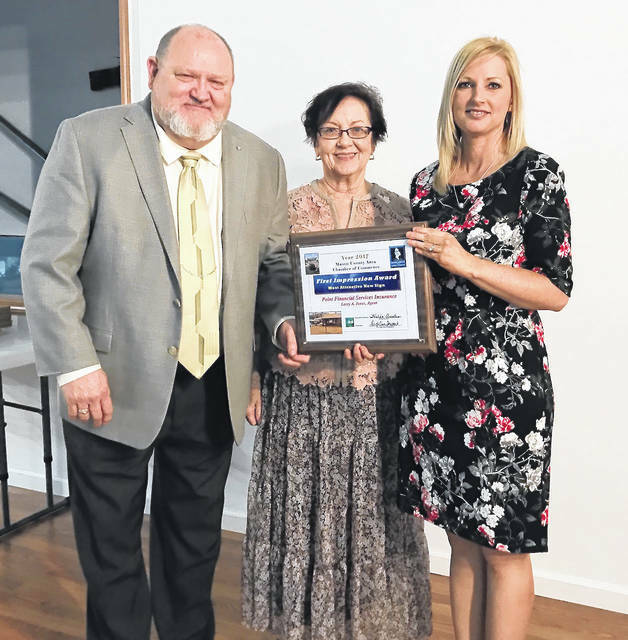 Chamber Director Hilda Austin and Chamber President Leigh Ann Shepard present the Best New Commercial Development Award to Dollar General of Gallipolis Ferry, represented here by Iva Johnson and John Sargent. 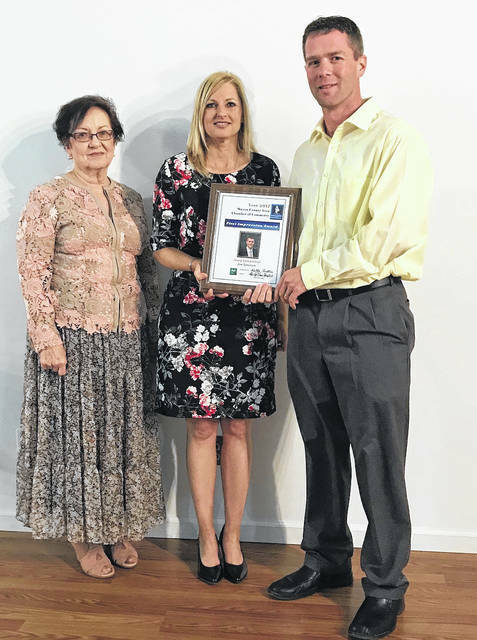 Chamber Director Hilda Austin and Chamber President Leigh Ann Shepard present the Young Entrepreneur Award to Jon Tatterson of Tatterson Appraisal Service. 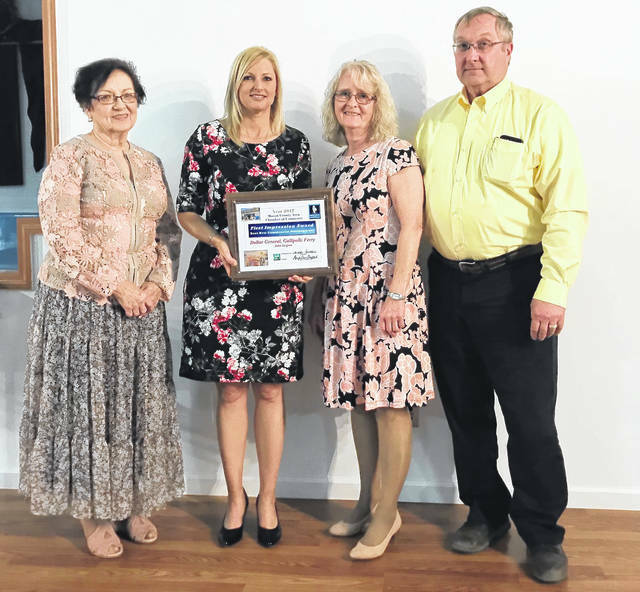 POINT PLEASANT — This week, the best in business and community service were honored at the 72nd annual dinner meeting for the Mason County Area Chamber of Commerce. Keynoting the dinner was Jamie Summerlin, a U.S. Marine Corps veteran from Morgantown, who has attempted to raise funds for veterans while literally running from coast to coast. Summerlin, started a cross country journey, in order to honor military veterans and raise funds for West Virginia-based Operation Welcome Home, a veteran’s facility for veterans, by veterans. Summerlin is now the CEO of Operation Welcome Home. He also helped start and organize the Morgantown Marathon to raise money for the veteran’s organization. As for the Morgantown Marathon, Summerlin said this year, when the race returns, all 50 states will be represented. “Take advantage of these opportunities, take advantage of things that are in your communities that you can use to embrace and support and help those around you that need the assistance to get back on their feet,” he said. Summerlin received a standing ovation from the audience. Taking home the prestigious Community Service Award was Robert (Bob) McMillan. McMillan graduated from Sherrod High School and attended West Liberty University. He is an Army veteran, having served in Vietnam. He’s the owner of Mid-Atlantic Construction Company based in Point Pleasant and serving the area for over 27 years. McMillan has supported numerous projects and programs throughout Mason County. Just a few examples include the Mason County Community Foundation, Krodel Park Playground, Point Pleasant Splash Pad and the Point Pleasant Lions Club. 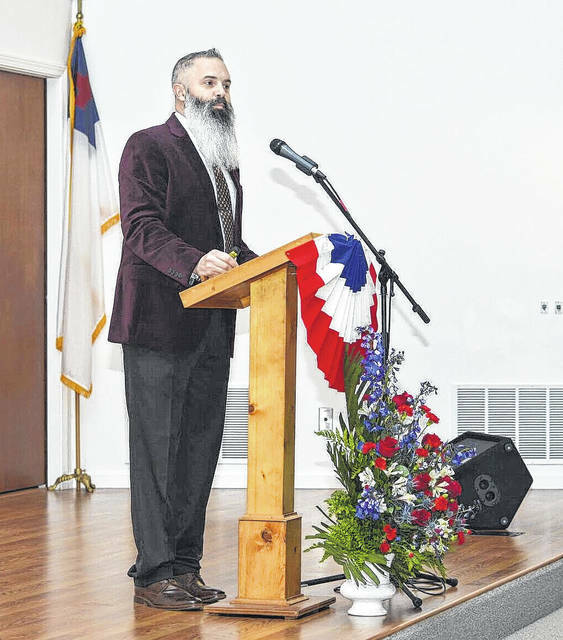 He belongs to the Mason County Community Foundation Board of Directors, the Economic Development Authority Advisory Board, VFW, American Legion, Moose Lodge, Minturn 19 Masonic Lodge, Beni Kedem Shriners, Scottish Rite, and Jesters. McMillan and his wife Rebecca have been married for 46 years and have lived in Point Pleasant for 45 years. They are members of the Nazarene Church. The couple have two children, Carrie and Jason, and four grandchildren. Best Landscape Award to the Point Pleasant Town Square project, which includes Hartley Square. Outstanding Downtown Revitalization Award to Counterpoint Cooperative. Best New Commercial Development Award to Dollar General of Gallipolis Ferry. The Young Entrepreneur Award to Jon Tatterson of Tatterson Appraisal Service. Most Attractive New Sign to Point Financial Services. Best Development Award to Beaches & Cream. Larry Jones received the Past President’s Award. The invocation was given by Cpt. James McCormick, US Army (Ret. ); Mayor Brian Billings delivered the remarks for the First Impression Awards; Chamber President Leigh Ann Shepard was the emcee; the First Church of God Kitchen Ministry Ladies provided the meal; Paul Doeffinger provided the entertainment before the event held at the First Church of God community building.